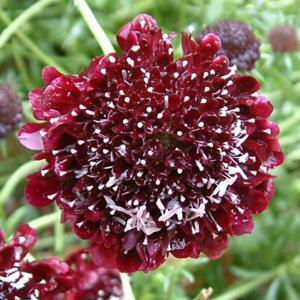 Short lived perennial with very dark maroon red, almost black flowerheads borne on wiry stems in mid and late summer. Greyish-green basal foliage. Well drained, neutral to slightly alkaline soil in full sun. Dislikes winter wet. Mixed or herbaceaous borders. Attractive to butterflies. Good cut flower.